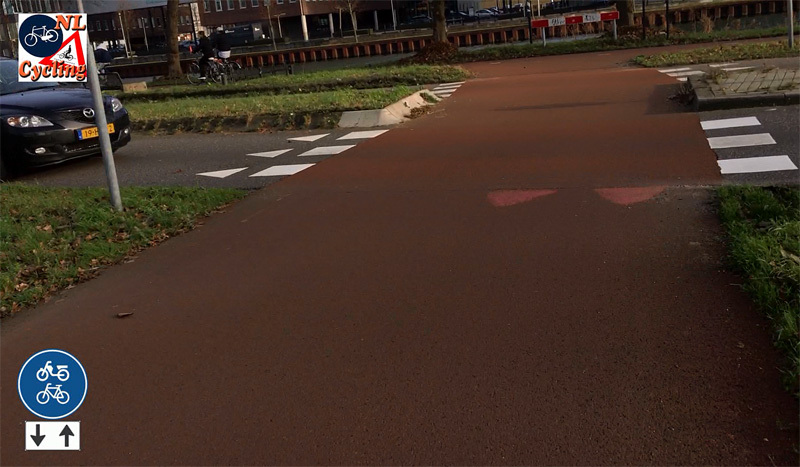 Utrecht has recently upgraded several main cycle routes in the city. In this post I show you the largest part of the route alongside Merwedekanaal. It is part of a much longer provincial route, but in the city it runs from the municipal border to Nieuwegein formed by the Amsterdam – Rhine Canal in the south-west to the municipal border to Maarssen in the north-west. The entire route in the city is almost 10 kilometres long of which I cycled almost 7 kilometres for the video (below). The cycle route at Kanaalweg where it is a cycle street where cars are guest. This was one of only 4 direct encounters I had with car drivers in the entire 7 kilometre route. The pictures in this post show every single one of those interactions. This is one of six routes which were upgraded to modern standards between 2012 and 2015. The council decision to do this was already taken in 2002 and Utrecht’s ambitions were explained in the report ‘Verder met de fiets’ (‘Further with the bicycle’; which in Dutch can mean further in distance and further in time with improved policies). With these upgraded routes the city aims to get people to cycle more often. Note, that it is not necessary to get people cycling, almost everyone already does in the Netherlands, but to get them to cycle more often, because that can still make a difference, even in this country. It would reduce CO2 emissions and thus improve the air quality in the city. This post focuses on the ‘purple route’ on the map below, running north to south in the west of the city. 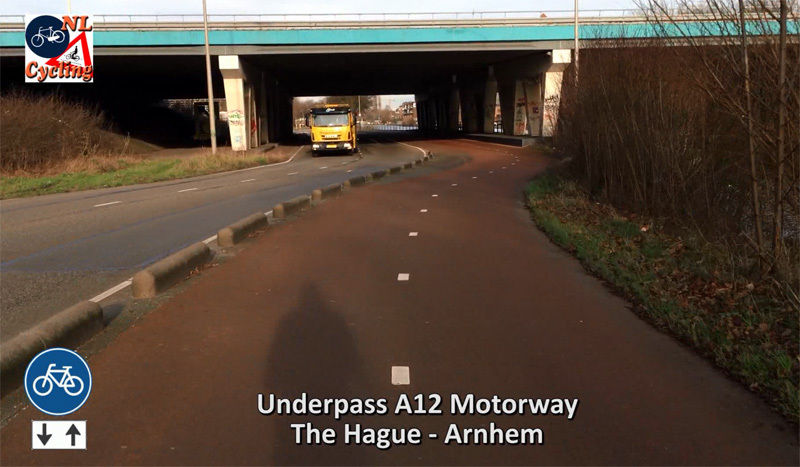 I doubt many people will cycle the entire route and thus traverse Utrecht. But it is very likely that people will cycle part of the route. There are many connections to very popular destinations that you can easily reach from this main route. 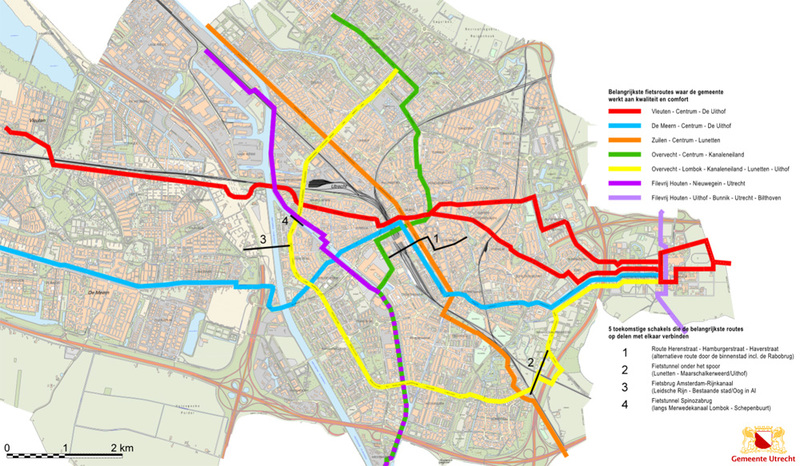 A map of the updated cycle routes in Utrecht. It can be enlarged by clicking the picture. The south part of the route I cycled is combined (Green/Purple). The north part splits in a route to the west and one more to the east. I cycled the west route. Picture City of Utrecht. The route alongside the canal was updated in stages. The north part on Keulsekade (“Cologne Quay”) first. There was one big obstacle here that had to be eliminated. A bridge (Spinozabrug) over the canal and especially its access ramps formed a barrier to cycling. You had to cycle wide around the bridge’s entrance ramps. To be able to cross the bridge more easily, the north access ramp got a cycle tunnel. This tunnel was built in one weekend! A video from the city shows how the bridge was closed on a Friday in May 2014 at 9pm, to be opened again the following Monday morning at 3am. In the meantime the tunnel had been constructed. Finishing took longer, but that could be done without interfering with other traffic. The tunnel was finally opened in November 2014. 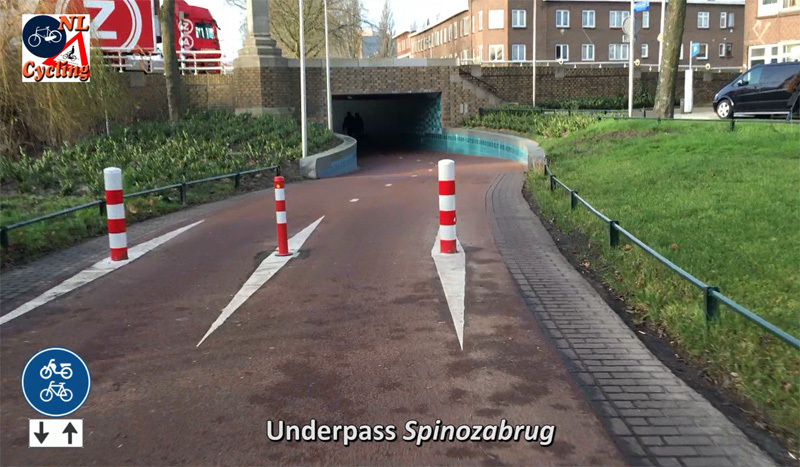 The new underpass under the approach of the Spinozabrug. This tunnel was built in one weekend in May 2014. 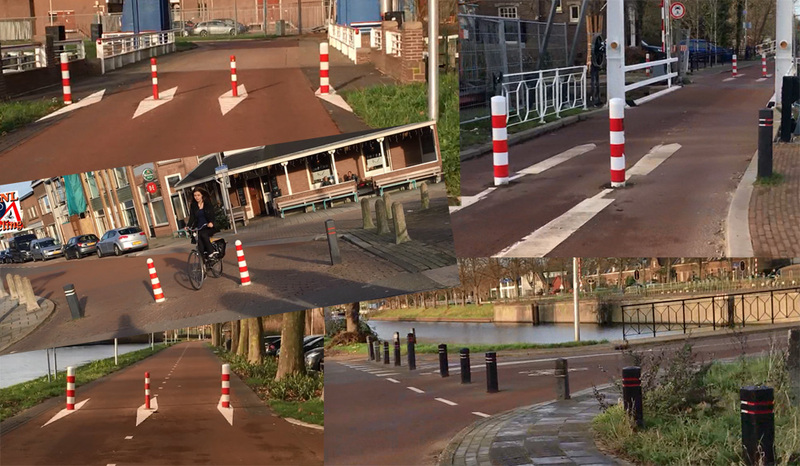 Utrecht claims it keeps bollards at least 1.6 meters apart as the guidelines recommend. Considering the cycleway is 3.5 metres wide, I sincerely doubt that it worked out right here. With that obstacle out-of-the-way the rest of Keulsekade could be updated. The entire length got red asphalt and the former two-way street was made one-way for motor traffic and it became a so-called cycle street. That means car traffic should behave as guest, while cycle traffic has priority. In the first plan all on-street parking for cars was to be removed. Parking is not allowed on a cycle street, except when there are separate parking bays. So didn’t the residents object? Yes they did. A published report with complaints shows that people were opposed to the one-way regulation because that would force them to make a detour. The city convinced these people that the one-way regime was necessary for the safety of cycling. Because of the complaints, the city created one extra exit for cars, which reduced the detour to only a couple of hundred metres. The parking issue got solved in a peculiar way. The residents of the house boats in the canal were willing to let their gardens on the shore be turned into parking bays. But the video reveals that that didn’t happen after all. Instead, every house boat got one parking bay right in front of it at the other side of the street. That settled the matter. Complaints that this solution didn’t solve the parking problems for visitors were simply dismissed. No one forces guests to arrive by car after all. The complaints from the residents about the red colour of the asphalt were also dismissed. Some claimed the red asphalt wouldn’t go well with the historic and monumental look of the street. Considering that the same people also fought to keep the car parking makes that sound rather inconsistent to say the least. The city dismissed this complaint as well, saying that the comfort for cycling on a main cycle route outweighs complaints about cosmetics. 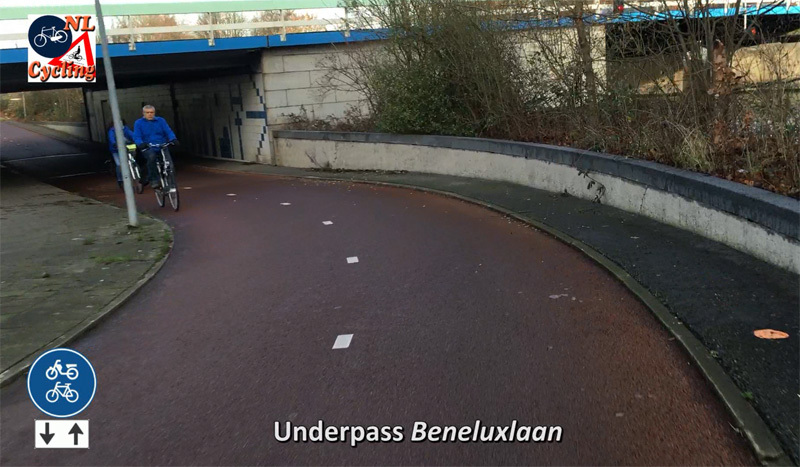 The route under the Beneluxlaan bridge has to go slightly below ground level to get enough clearance. Finally, people feared that such a fine and wide cycle route would attract more noisy and smelly scooters and mopeds, with a specific type of youth using those mopeds, who would hang out in the streets bothering residents. It is amazing how hated mopeds are in the Netherlands, yet there still is no regulation to send them off the cycle routes! Therefore the city had to answer that it can do nothing to prevent mopeds and scooters using the cycle routes (yet). One of only very few level crossings. This is one with a minor route for motor traffic. You can see that the sharks’ teeth have been changed. Before the update, motor traffic had the right of way, now it is the other way around. That is why the sharks’ teeth pointing to people cycling have been scraped off the cycle path surface. Note, that the white blocks to indicate this crossing (the ‘elephant’s feet’) are outside the path. This is the new prefered solution. 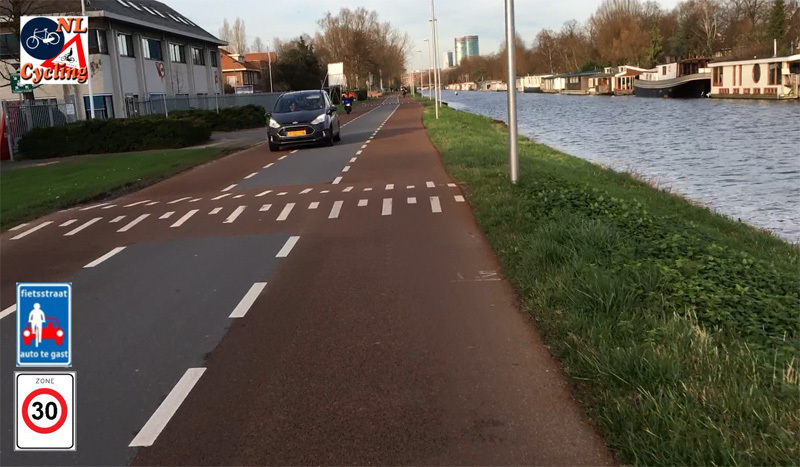 The south part of the route, Kanaalweg (“Canal Road”), was updated in the first half of 2015. There are far fewer residents in this part so there weren’t many objections here. Here the route is on a “fietsstraat” a cycle street where cars are guest. This was one of only 4 direct interactions with a car on the entire 7 kilometre route. People did express concern that the route would not get a pedestrian area everywhere, especially since a designated ‘joggers-route’ takes this route as well. But the city said that the 5 metre wide cycle street would be enough to allow shared use by people cycling, walking (running) and the incidental motor vehicle. Where there is more motor traffic the route runs on a separated bi-directional cycleway. This is the case on Winthontlaan. 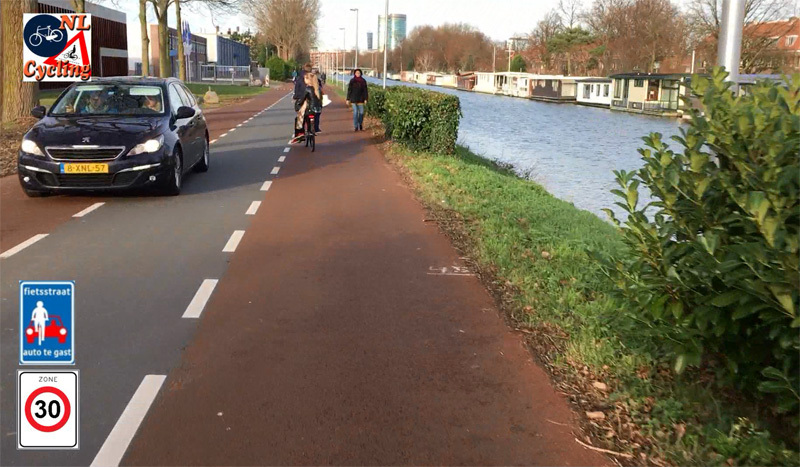 A separated cycleway had already been there, but it was resurfaced with smooth red asphalt and it was widened to 3.5 metres, according to the CROW recommendations for a main cycle route. Some people opposed to the bollards, especially to a whole row of bollards that were placed at several locations. The city responded that here too, the latest recommendations were followed, meaning that there is a 1.6 metre gap between the bollards. That is what is on paper anyway, reality seems a different matter. There are quite a few rows of bollards in this route, particularly around the many bridges. I doubt any of those rows of bollards really has gaps of at least 1.6 metres between them. Considering how many one-sided accidents happen in this country, with people cycling and bollards, this is really something that should be studied and changed if necessary. 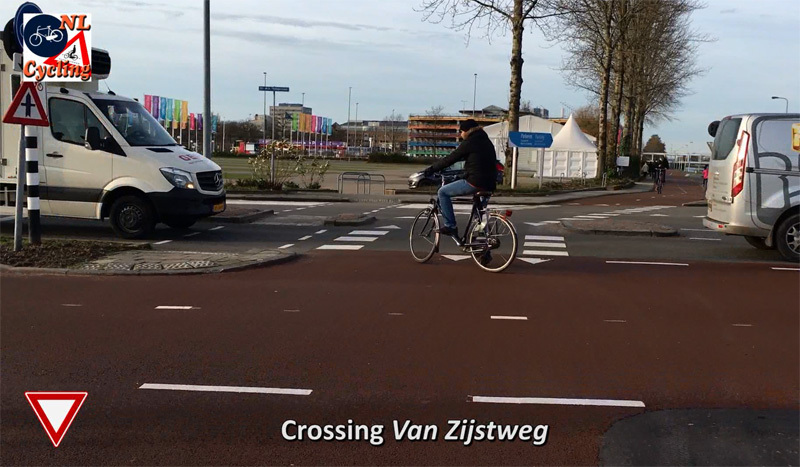 The worst crossing in the entire route is this one with Van Zijstweg. It will be updated soon. The city is making a plan right now that will be up for comments in the first quarter of 2016. Almost all crossings with other main routes are grade separated. I have included a picture of every single one of the multi-level crossings. In the entire route there is only one level crossing where cycling doesn’t have priority and that is at the crossing with Van Zijstweg. This is a major bus route that has yet to be updated. The city is currently making a plan that is expected to become public in the first quarter of 2016. It was already agreed that the intersection will be updated to the sustainable safety principles. That means it will have to look quite different from what it is today. With a much bigger and better refuge island between the motor traffic lanes to name just one current problem. 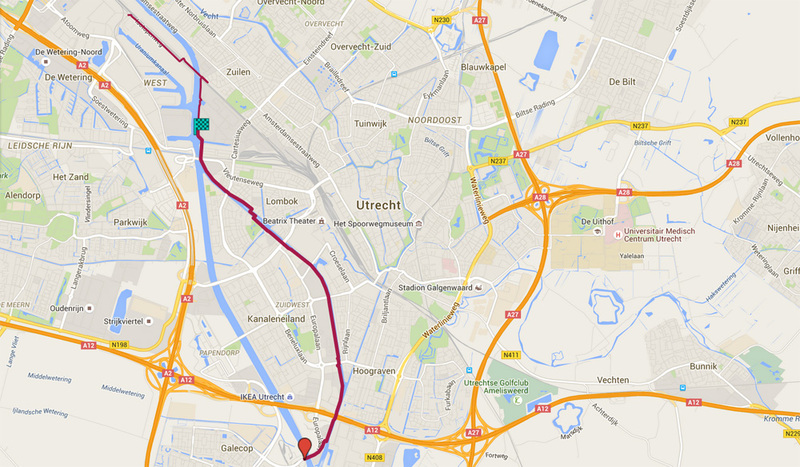 Considering you traverse a big part of Utrecht on this route, it is a very fast route. I cycled the 6.8 kms in almost 18 minutes. That means I had an average speed of 22.7 km/h (14.1 mph) even though it felt like a leisurely pace. Only one (rolling) stop makes all the difference. You can reach high average speeds on Dutch cycling infrastructure because you can cycle almost non-stop. There is no need to speed. So what does the route look like? See for yourself in the long video and the pictures in this post. This underpass is combined with an underpass for motor traffic. On top of that viaduct is the A12 motorway (freeway) running west – east in the country from The Hague on the coast via Arnhem all the way to the German border. It has 13 lanes for motor traffic at this location. Most underpasses make use of the fact that the crossing roads are at a higher level to cross the canal. That makes a tunnel in the approaches to the bridges relatively easy. This is an overpass for pedestrians who walk from the parking garage on the left hand side to the exhibition halls and conference rooms of the Utrecht exhibition center on the right side of the canal. 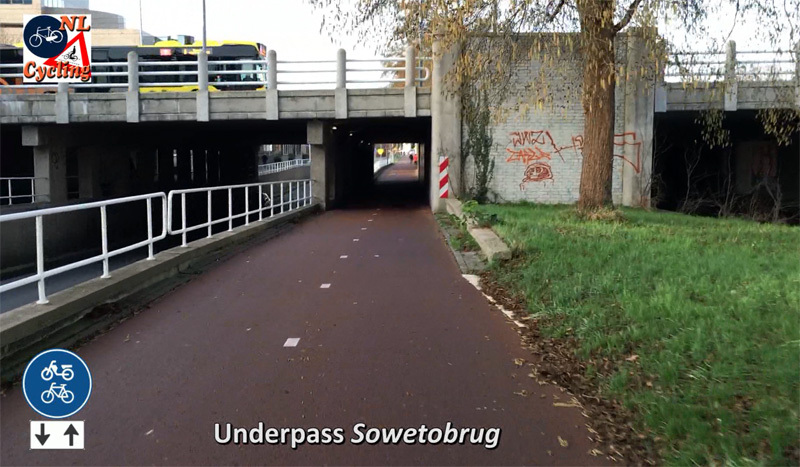 This is the narrowest underpass of the entire route, under the Sowetobrug. (Before 1986 known as Paul Krugerbrug). There really isn’t much that I dislike about this route update, but for one thing. I genuinly don’t understand these bollards! You only see them in the last part of the route I cycled, not in the first 12 minutes. So if they’re not needed there, why have them here? Utrecht, fix this! The route I cycled from south to north. It is a Google Map I made. Long video of the entire route in real-time. 6.8 kms in 18 minutes, or an average speed of 22.7 km/h (14.1 mph). Why am I getting so many thumbs down for this comment, it was made in good faith? Pun not intended. Maybe people feel those remarks and questions are just a bit too personal? I follow your site a long time and with much interest, but the assessment thumbs bother me and are a childish way to judge anyone and do not belong in a serious site like this. I hope you can and will turn them off. Did you at least like the joke? I really can’t believe it! But it seemingly really happened that a Cycling Tunnel had been built up within one weekend. Is this already registered at the Guiness Book of World Records? Amazing… Breathtaking… Wonderful! Quite sad to see Utrecht is getting the ‘English Disease’ of littering. Noticed quite a lot on the route. You have long had a problem with graffiti so I hope the authorities don’t wait for things to deteriorate to that extent before tackling it. At 12:42, how did you know that the main route continued to the right? I didn’t see any wayfinding signage there, or in general. This route definitely benefits from being along the water. I imagine other routes have a lot more cross-streets to contend with and are probably slower to bike on? I would guess that as the red asphalt turns to the right, you follow that. Otherwise, you probably need a map or to be a local. That’s right: the red asphalt continues to the right and only there. It’s like following a red carpet, or as easy as following ‘the yellow brick road’. No signs needed this way. It is not exceptional to have such fast routes through the city. Here’s an example from ‘s-Hertogenbosch. Five kilometres non-stop cycling with priority. Just another great video to watch. 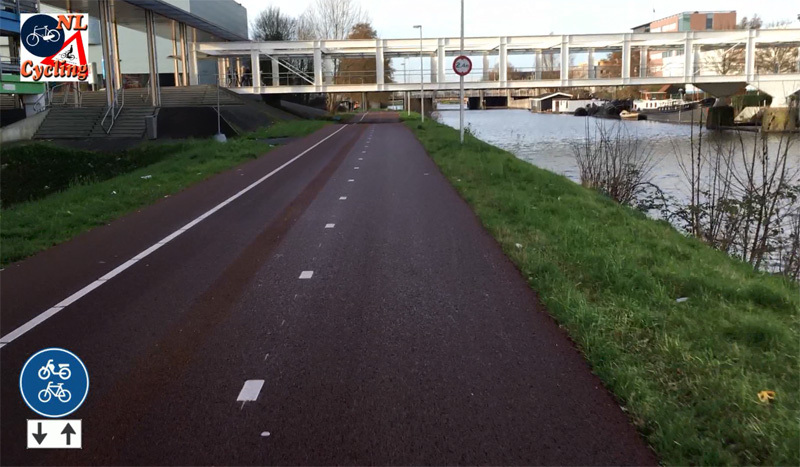 I moved to Utrecht 5 month ago and I didn’t know this cycle route, I will ride it too. I also recommend you do the one to Breukelen. If can follow the Oudegraght north bound all the way to Maarsen and the Breukelen. Another one I like a lot is the one from Utrecht to Zeist, passing Bunnik through the woods. If you feel like going a little further, the one from De Bilt to Amersfoort is great, too. Love the video – There are a few people riding on the back of the bikes with both legs over one side. I just moved to Belgium, and I see people riding on the backs of bikes but they put one leg one each side and face forward. Do you ever have people doing that in the Netherlands, or is it always the side-saddle variety? Both varieties happen in the Netherlands, I even get the impression the one leg on each side is more normal, but there may be (probably are) age and/or gender differences in preference for one style or the other. When I was a teenager (in the 90s), there was a clear gender difference: boys had their legs on both sides, girls on one side. My obeservations: Smaller children usually have their legs on both sides (and the remain sitting when the rider dismounts). Most adults nowadays seem to prefer two legs to one side, which is more comfortable. I think most (grown-up) people in the Netherlands ride side-saddle, but some (and more so children) do take a ride with one leg on each side. The reason for side-saddle is that it is more comfortable as you don’t have to flex your muscles as much to keep your legs up and it’s easier to jump on a slowly moving bike once you get the hang of it. It only feels a bit less safe in case you’d fall to your back side. Side saddle is mostly women here in NL, especially common when they’re wearing skirts or dresses. Both can be seen, but I will say from personal experience that riding side-saddle is far more comfortable. Legs quickly fall asleep with those racks. It is wise that just hating something, even by a majority of people, does not lead to regulation and bans. In 1941, Jews were a pretty hated group across Germany, yet nobody suggests these days that it was a good idea to exterminate them. Look on the bright side. They aren’t using cars (scooter riders that is). And if they are electrically powered, and the limiter system works better, IE not an optional attachment, I think the moped problem should be reduced. Sending the scooter riders out onto the road with a helmet would be a ridiculous idea if it were proposed for a cyclist, yet scooter riders are considered for it. It would be like sending someone with a bunch of weights on panniers of a race bike onto the road assuming they could do 40 km/h. The mass of the cars, and especially trucks and buses, is just too much for a snorfietser. I don’t ride scooters, I don’t really care for one, but at least they shouldn’t be dead riders. Only when there is a risk that outweighs the benefits of something can it be banned. For many scooters and mopeds helmets are already mandatory and those are also already banned from riding on cycle paths. Their maximum allowed speed on roads is 45 km/h. What you think of as being a ridiculous idea is already the norm for many mopeds and scooters in Netherlands. For me personally the whole diviide between the bromfiets and the limited in speed snorfiets never made sense. Get rid of the snorfiets and it’s exception rules, and just label everything a bromfiets. The problem with the scooters is the extremely inefficient combustion. Therefore a lot of dangerous fumes are emitted. When you are cycling with a considerable effort this will keep you from continuing at speed. So most scooters will make a bikepath unusable for more than a minute in calm weather. Not a nice idea on long paths with a lot of commuters. The situation is even worse for the “snorfietsen”, which have the same combustion volume but are downgraded even more. They ride typically 30-35 km/h (legal speed is 25 km/h, so when you are overtaken it is better to stop for a minute. These should completely be banned as they contribute significantly to the total automotive pollution on the ultimately wrong location. And if that is not achievable they should be banned from bikepaths at least. With that speed the e-scooter is an equivalent replacement, readily available. Snorfietsen are acceptable if the exhaust is just in front of the nose of its rider. A general rule for cycling is “Do no harm”. With that in mind traffic rules can and will be applied flexible in time and space. Scooters and snorfietsen *do* harm. I do not think it is appropriate to relate this to any hatred to whatever group of people in some era. Here in Switzerland, one can see some electric scooters (while regular mopeds are dying out). Tiny littly things, max. speed 25 km/h, no noise or pollution. Usually people from Asia or Latin America buy them. I think if you do not / cannot pedal yourself, better buy an electric scooter than a noisy and stinky one. That’s a problem with the engine not the existence of scooters. Electric scooters are also becoming more popular among those wanting a moped. Your parent’s and David Hembrow’s parents should be given the medal of honour just for creating you two for bringing to the world’s attention the solution to safe, happy and healthy cities, bicycles, walking and public transport. How are your parent’s doing BTW? Last time I checked your dad was in a wheelchair, you used that as an example of how streets can be good for walking in access roads to get to a car, and your mother sent you spokes for a wheel in Germany in the 90s just after reunification? 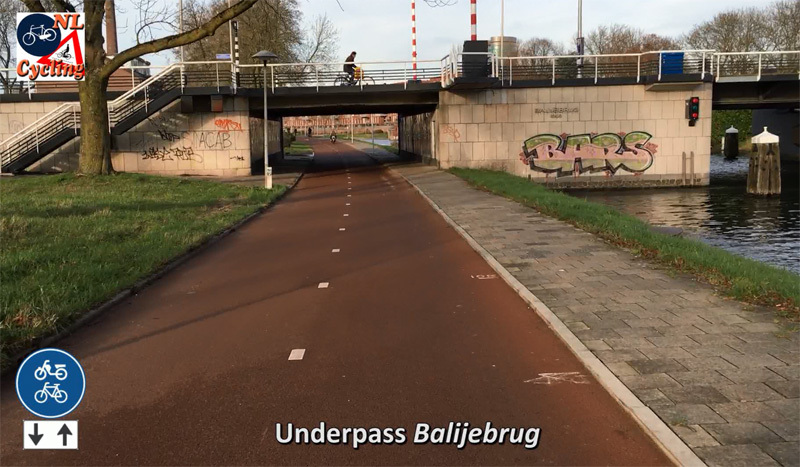 This entry was posted on 19 January 2016 by Bicycle Dutch in Original posts and tagged cycle streets (Fietsstraat), cycle superhighways, long distance cycle paths, Utrecht.